Self-rising flour is flour with baking powder and salt already added. A staple in many Southern recipes, it’s traditionally milled from softer, lower protein wheat, which is what grows in the South; and it produces softer, more tender baked goods than all-purpose or higher-protein flours. Homemade self-rising flour can be used in any recipe that calls for self-rising flour. To replicate soft, Southern-style self-rising flour, start with our Perfect Pastry Blend (10.3% protein) or Unbleached Pastry Flour (8.0% protein), instead of all-purpose; and add baking powder and salt as directed in the recipe below. If you use King Arthur All-Purpose Flour (11.7% protein) to make homemade self-rising flour, be prepared to increase the liquid a bit in any recipes you use it in (to account for this flour’s higher protein level); and expect the results to be a bit less tender. Note: If you weigh your ingredients, Unbleached Pastry Flour weighs 3 3/4 ounces per cup; Perfect Pastry Blend, 4 ¼ ounces. Whisk together thoroughly. Store in an airtight container at room temperature. White Lily is a soft wheat flour that is ideal for pastry like biscuits, cookies & pie crust because of its low protein/gluten content. Because of this it is not a good choice for pizza crust or other bread doughs where you need higher gluten to give the dough structure & texture. Use all purpose or bread flour for pizza dough & you will be much happier! 1) Use 1:1 ratio of coconut flour to liquid. Coconut flour is very absorbent. 2) Do NOT replace ALL the flour in a recipe with coconut flour – replace only one fourth the amount of flour in a recipe with an equal amount of coconut flour. Eg: If a recipe calls for 1 c all purpose flour, you can instead use: 3/4 c all purpose flour + 1/4 c coconut flour + 1/4 c ADDITIONAL LIQUID. This stuff is EXPENSIVE. Because of that, there are NO good recipes available for it. Except for dieters and people too ill to eat flour (people with celiac’s disease and allergies). Because they’re the best source for dessert recipes. A hard boiled egg is cooked in its shell in boiling water. The “hard” refers to the consistency of the egg white (or albumen) and the yolk. Making them is simple. Fill a pot with enough water to cover your eggs by about two inches. Bring it to a boil and carefully drop in the eggs and leave them for 10-12 minutes. For easier peeling, place the eggs immediately in an ice water bath after boiling, then gently tap and roll them on a counter. (There’s also the gimmick of adding a teaspoon of baking soda to the boiling water to help loosen the shells, cracking the shells off both ends, and blowing the egg out of its shell. Look it up on YouTube.) Bonus: you can hard boil a bunch of eggs at a time and refrigerate them. Eat them with a sprinkle of kosher salt, or chop onto salads. 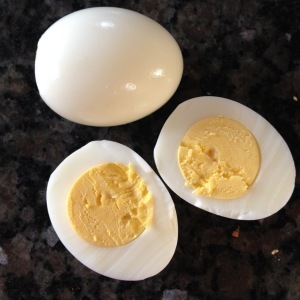 Soft boiled eggs follow the same process as hard boiled eggs, but you cut the cooking time roughly in half. This gets the egg white cooked while leaving the yolk runny. Our preferred method is the “six minute egg,” which sounds way fancy. The six minute egg is just like it sounds: bring your water to a boil, gently lower in the eggs, set a timer for six minutes, then remove the eggs and drop them in an ice bath. Sometimes soft boiled eggs are eaten in the shell, stood upright in little egg cups. You can then daintily tap the top of the egg with a spoon and scoop out the insides. They’re great on toast, sprinkled with salt, pepper, and hot sauce. We also love dropping a couple on a thick black bean soup. 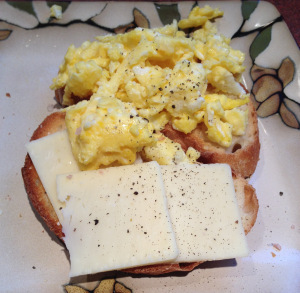 Scrambled technically means that the whites and yolks are broken and mixed together. Hard scrambled eggs are cooked all the through. This is the default preparation for scrambled eggs at most restaurants, and they’re good, sometimes dry. That’s why I prefer soft scrambled eggs, sometimes referred to as “wet.” The difference between soft and hard scrambled eggs is cooking time. If you want soft scrambled eggs, you need to keep in mind that eggs. cook. quickly. You can’t walk away from them. Whip your eggs in a separate bowl. Heat your pan no higher than medium, grease it, pour the eggs in, then stay close with a spatula. Turn and fold them repeatedly while they cook. Use the spatula to prevent them from spreading out, especially up the sides of the pan; when they spread too thin, they’ll over-cook quickly. I usually fold them until they no longer look runny, but still look wet (i.e. light is reflecting in them). Have your plate ready so you can remove them from heat immediately. They’re perfect on buttered toast with salt and pepper; with cheddar cheese. If you want super creamy soft scrambled eggs, you can use the method we learned from Gordon Ramsay (watch it here). Drop eggs into a pan over medium-high heat, along with one, thin pat of butter for each egg. Then start stirring with a spatula. Break the yolks, let them mix with the butter and whites. And keep stirring. If the pan gets too hot, lift it off the heat briefly. And keep stirring. Do this for about 4-5 minutes, until the eggs start coming together. Right before you take them off the heat, add a dash of milk, sour cream, or creme fraiche. Stir that in, then ladle the eggs onto toast and sprinkle with herbs (chive, dill, green onion) or salt and pepper. The result is some of the creamiest, softest eggs you’ve ever tasted. 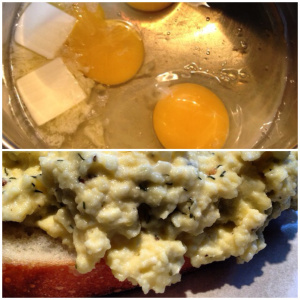 Scrambled eggs can be manipulated in many ways. 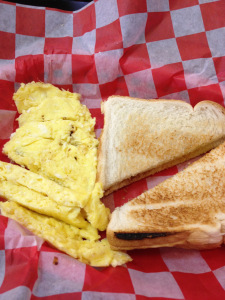 Ordering plain scrambled eggs means they’ll be mixed and moved in the pan, whereas an omelet or frittata indicates that the scrambled eggs are cooked until they’ve stabilized into a usable form and topped with other ingredients: cheeses, meats, vegetables, anything. A frittata is typically open-faced, whereas an omelet is folded over in half onto the additions. 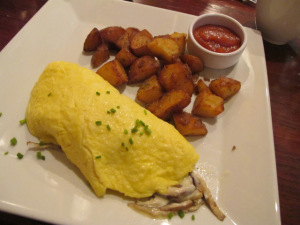 But the egg base remains the same (except in egg white omelets, where yolks are separated out). These preparations are pretty simple, as far as eggs go. A scramble usually means other ingredients are scrambled in the pan with the eggs. This could include meats, cheese, sauteed veggies, or diced potatoes (or, yes, hot dogs). 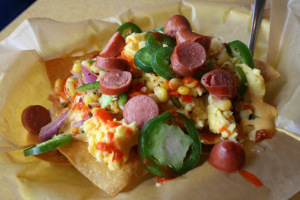 Good if you’re a fan of scrambled eggs and, well, everything else breakfast has to offer. Heat the canola oil over medium heat. You don’t want it too, too hot, as you’re going to cook the eggs pretty slowly. You don’t want the oil so hot that the egg sizzles and turns white the second you crack it in! The whites should remain clear for several seconds before they start to turn white. Once the oil is mildly hot, crack in an egg. (Note: three is about as many as I can tend to at a time.) The oil should not cover the whites; if anything, it should just come over the edges a tiny bit. 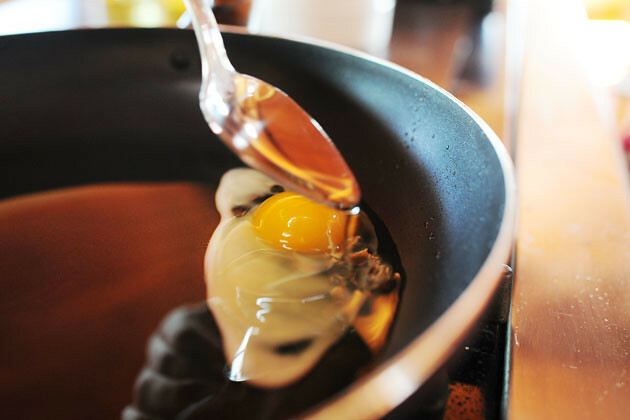 Once the eggs begin to turn white, use a small spoon to carefully spoon the hot oilover the whites only. Go from egg to egg, spooning the oil over the whites. This will help the whites cook slowly so that they won’t be slimy. *Important: Don’t spoon any oil over the yolks yet! After a minute or two, touch the whites of one of the eggs and make sure they’re set/not jiggly and loose. At that time, you can spoon oil over the yolks to help them set on the surface. And that’s a tragic thing! On the other hand, if you wait, the egg will settle into the skillet and the whites will sheet over the sides of the yolk and eventually leave mostly yolk there. So a minute or two into the process, if you spoon the hot oil over the yolk, you won’t get that cloudy appearance. To repeat: the two photos above are a cautionary tale. And that’s it! This is a neato method, guys. Once I learned it and practiced a bit, I had some fun with it. It’s particularly fun if you’re cooking for guests and you want your breakfast dish to look really yummy and inviting. 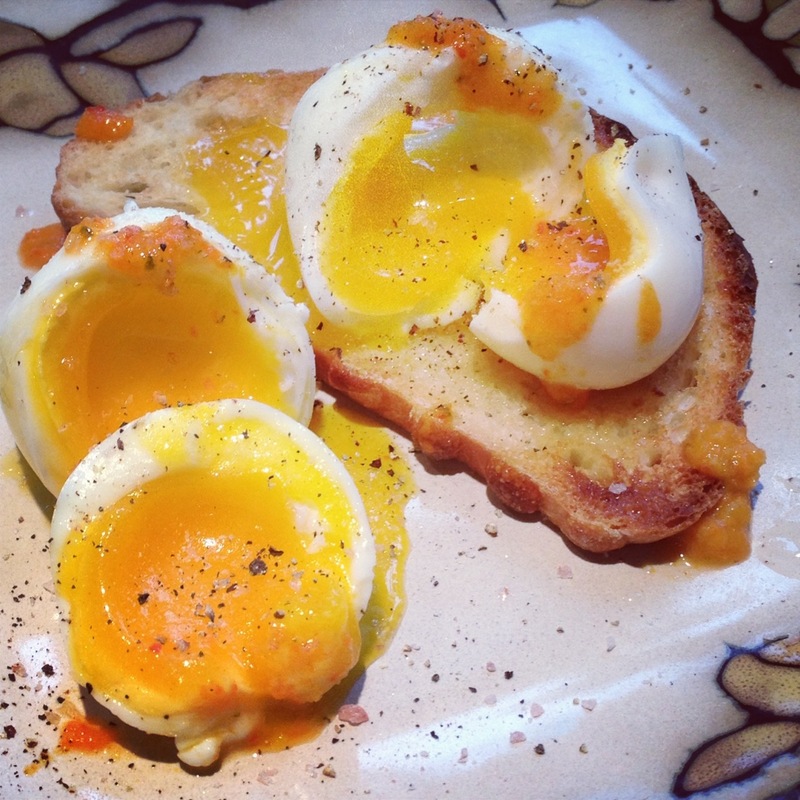 It’s also great for foodbloggers or food stylists who need picture-perfect eggs. But it’s also a lot of fun for kids because the eggs stay bright yellow and white and look like…well, like fake eggs, which kids get a kick out of. The only thing you really need to keep an eye on is the oil/fat and making sure you dab it/drain it off as much as you can. 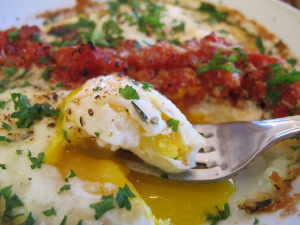 Eggs over easy and sunny side up are often using interchangeably, but they are different. 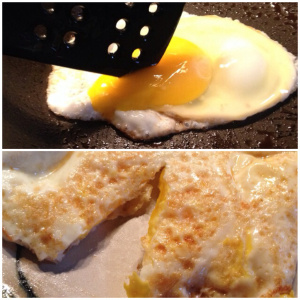 You go from sunny side up to over easy by simply flipping your egg when the edges are brown. The “easy” doesn’t refer to the simplicity of turning over an egg, but the state of your yolk. 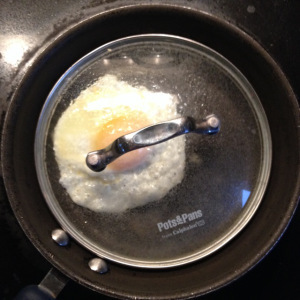 “Over easy” means the egg is flipped and cooked just long enough to make a film on the top of the yolk. 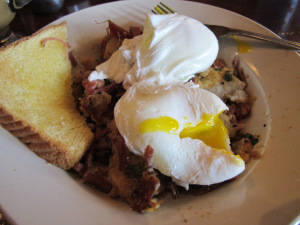 When served, the yolk – and some of the whites – are still runny. Over medium is the next step after easy: they’re fried, flipped, and fried a little longer, enough to cook the whites through and brown the edges slightly. You’ll develop a thicker film on your yolk, but the inside is still runny. Good for those like the dipping quality without a watery egg white. And over hard is the final step. 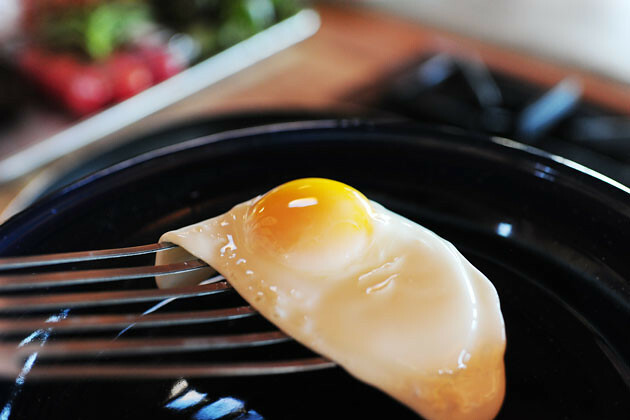 Over hard is fried, flipped, and fried again – usually with the yolk broken – until both the white and the yolk are completely cooked. Just tap the edge of your spatula into the yolk or poke it with a fork before turning it over. 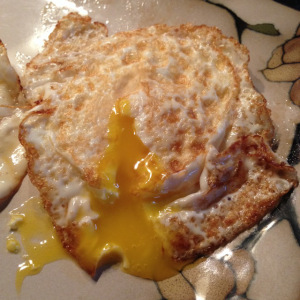 Be careful not to dribble the yolk when flipping. Poaching is like boiling but without the shell, or like over medium that skips contact with the pan. These means you’re avoiding any hard edges. The white is cooked through and the yolk is warm and runny. Just imagine it mixing with a bright hollandaise on an eggs benedict. 1.) The Whirlpool. Heat your water just shy of a rolling point. Add a dash of vinegar (some recipes call for a 1/2 cup, but that’s always too much for me. I don’t like my eggs tasting like acetic acid). Crack the egg into a tiny bowl. 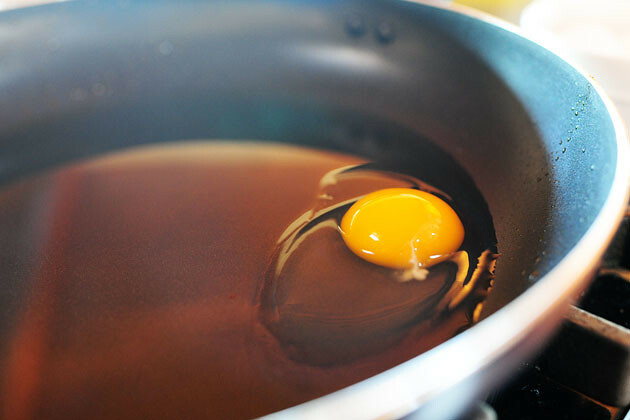 Swirl the water in your pan to create a whirlpool, then carefully drop the egg into the center. The swirling pulls whites altogether in the center. Leave it in the water for about five minutes, then lift out with a slotted spoon. 2.) The Strainer. Heat water. Add vinegar. Crack the egg into a mesh strainer to let the most watery portion of the whites (it’s not much) drip out – this prevents danglers. Carefully decant the egg from the strainer into the water. Cook for about five minutes. Retrieve with slotted spoon. And if you make a mistake… well, just look up some recipes for egg drop soup. Baked eggs are cracked and baked in a dish. “Shirred” refers to the flat-bottomed dish in which they’re frequently cooked. They’re almost always mixed with other ingredients. 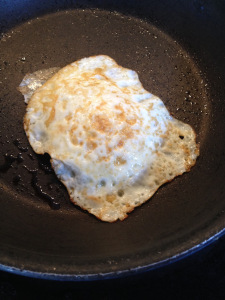 The white mixes in and gets cooked through, while the yolk is left runny. For example: a tomato provencal dish (pictured from Pistacia Vera), with eggs cooked into a bed of cream, tomatoes, cheese, and herbs. Or the North African/Mediterranean dish shakshouka (like at Mazah). The benefit of this preparation is that the egg really blends into the ingredients. 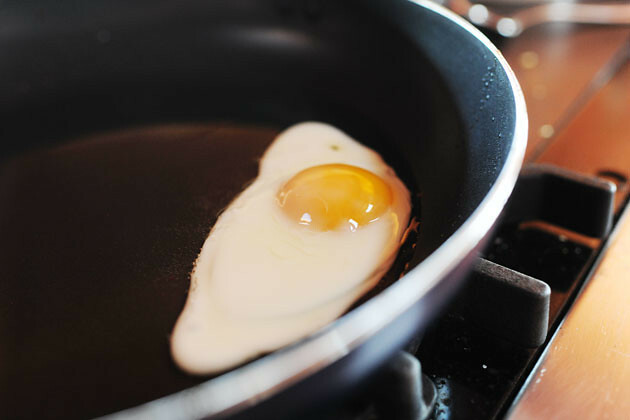 Generally basted means liquid or steam is used to thoroughly cook the egg white without flipping. For instance, while frying an egg in butter, you repeatedly scoop and pour the extra butter on top of the egg. This cooks the yolk and top whites without forcing you to flip it. Alternatively, you can also squirt some water into the pan and then cover the egg with a lid, to steam the whites. If you do this quickly, you can cook the whole egg before the edges start to brown, which seems to be the appeal of basted eggs (much like poached eggs). 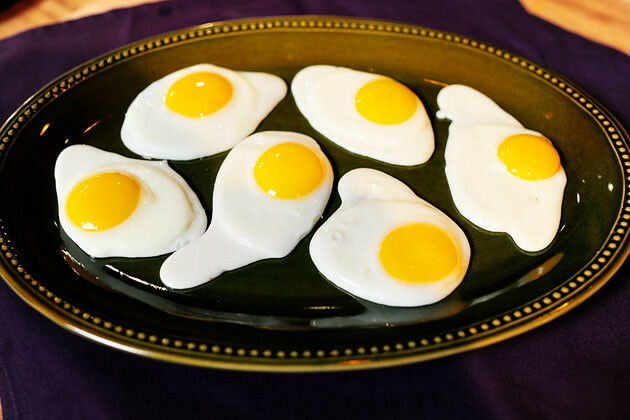 One specific form of basting is known as Spanish fried eggs. 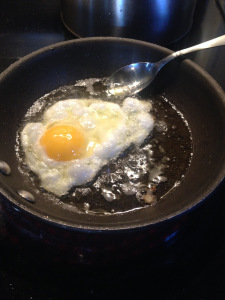 The eggs are fried at high temps in olive oil, while you spoon the hot oil over the egg. The eggs are fried over medium heat, just below the oil’s smoke point. Crack an egg into a small bowl first, then ladle it into the hot oil, and start scooping oil over the white and the yolk for about 1 minute. The result is crispy edges, creamy whites, and a runny yolk. 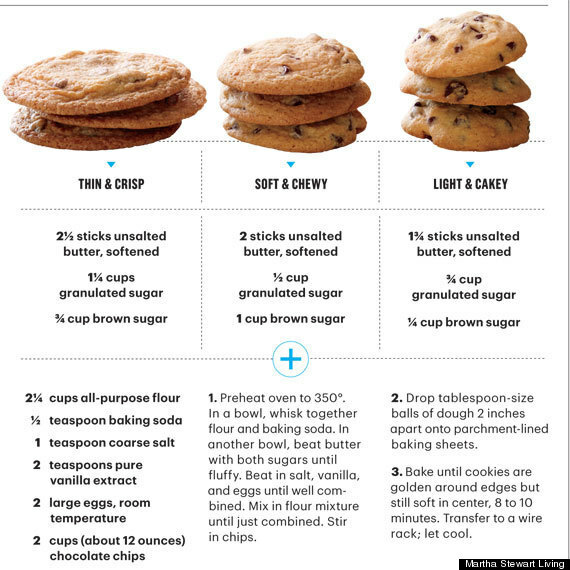 Martha Stewart’s Amazing Guide to Chocolate Chip Cookies – she scientifically explains how the proportion of butter, sugar, and brown sugar affect the texture, taste and loft of the cookies. This advice is EXCELLENT not just for this recipe, but for evaluating any other recipes that you may find in order to get a better idea of how they will turn out and whether that suits your preference — AND, most importantly, how to adapt another recipe to customize it to you and your family! Sift together flour, salt, baking powder, and baking soda. Preheat oven to 350 degrees. Beat butter and sugars with a mixer on medium-high speed until pale and fluffy, about 4 minutes. Beat in eggs 1 at a time. Add vanilla. Reduce speed to low. Add flour mixture; beat until combined. Mix in chocolate chips. Using a 2 1/4-inch ice cream scoop (about 3 tablespoons), drop dough onto parchment-lined baking sheets, spacing about 2 inches apart. Bake until golden around edges but soft in the middle, about 15 minutes. Let cool for 5 minutes. Transfer cookies to a wire rack, and let cool completely. Dough can be refrigerated for up to 5 days. Cookies can be stored at room temperature for up to 3 days. Preheat oven to 350 degrees. In a small bowl, whisk together the flour and baking soda; set aside. In the bowl of an electric mixer fitted with the paddle attachment, combine the butter with both sugars; beat on medium speed until light and fluffy. Reduce speed to low; add the salt, 1/4 cup water, vanilla, and eggs. Beat until well mixed, about 1 minute. Add flour mixture; mix until just combined. Stir in the chocolate chips. Bake until cookies are golden brown 12 to 15 minutes. Remove from oven, and let cool on baking sheet 1 to 2 minutes. Transfer to a wire rack, and let cool completely. Store cookies in an airtight container at room temperature up to 1 week. NOTE: These oven temperatures are a guide only. Always refer to the manufacturer’s manual.